Single-hit production solutions are known to produce significant reductions in cycle times compared with multiple set-ups on several machine tools. However, few applications result in a time saving as great as that being achieved by Plymouth subcontractor, Morris Engineering, during the production of a military aircraft gyroscope part from S420 stainless steel bar. 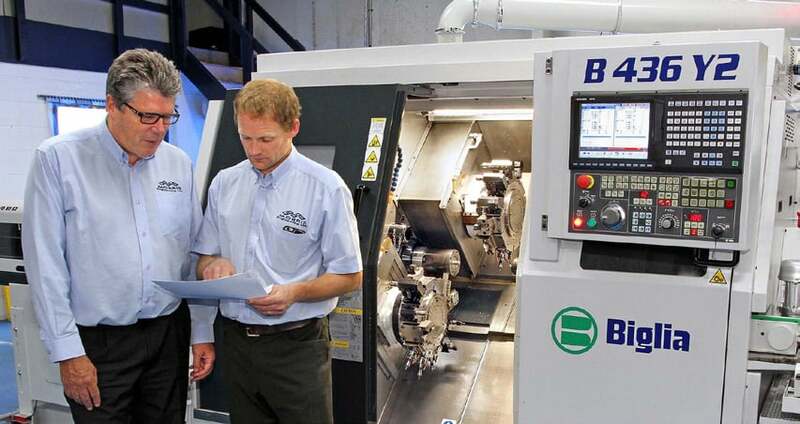 Using a 36 mm capacity Biglia B436-Y2 twin-spindle lathe with two Y-axis turrets supplied by Whitehouse Machine Tools, the component is now turned and milled in a 7.5-minute cycle. Previously, it took ten times longer – one hour and 15 minutes – to machine the part on three separate machines. It involved a 3-axis CNC lathe; a CNC mill with a 4th axis; and finally a manual lathe, which was needed to achieve the required surface finish in a face groove. The 10-fold improvement is in cycle time alone. The former production route also required inter machine handling, so costs associated with extra labour and administering work-inprogress are also saved. Morris Engineering’s production director Antony Dyer explained, “The main problem previously was the limited spindle speed of our 3-axis CNC lathe. Managing director Tim Winzer added, “The onehit machining capability of the Biglia lathe has already resulted in our receiving an additional aerospace contract to produce another complex, stainless steel part for a military aircraft. “We would not have won the job if we had quoted based on a multi-hit machining approach; in fact it would have been pointless quoting at all. “Now we intend to leverage our economical, one-hit turn-milling capability and our AS9100 accreditation coupled with our bronze award in SC21 supply chain management to pursue civil aerospace work at tier 2 or tier 3 level, which we are actively seeking. The B436-Y2, delivered in March 2016, is one of two Italian-built Biglia turn-mill centres purchased from Whitehouse Machine Tools. In January this year, a twin spindle 465 T3Y3 with three Y-axis turrets was installed after Morris Engineering discovered that it could purchase both machines for the price of a single lathe offered by a shortlisted competitive supplier. So instead of having one big lathe producing components from 6 to 65 mm in diameter, smaller parts up to 36 mm diameter are efficiently machined on the nimbler B436-Y2, while larger parts go onto the 465 T3Y3. This strategy has the added advantage of deploying two machines rather than one, doubling productivity, and also provides redundancy in case of downtime on one of the machines. 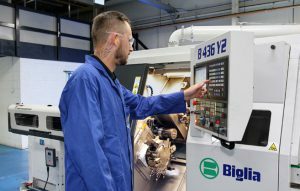 Both Biglia lathes are employed for the production of a family of five stainless steel gyroscope parts in batches of around 200-off, the previously mentioned component being one. 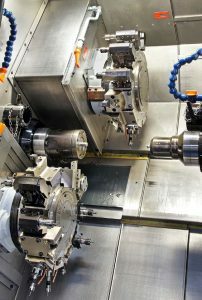 Three are turn-milled on the smaller lathe, one on the larger machine, while the fifth can be produced economically on either. LNS Quick Load Servo 80 magazines for one metre bar were supplied by Whitehouse Machine Tools for feeding both turning centres as part of the turnkey packages. A twin conveyor arrangement on the output side of each lathe directs machined components onto a second conveyor at right angles to the first, carrying them into a container at the front. However, by the time a bar remnant arrives on the first conveyor, the control has already told the second conveyor to reverse direction so that the bar end is routed to another container at the rear. The extensive milling and drilling capability of both lathes has resulted in a dramatic lowering of the workload in the milling section in Plymouth. It has consequently freed a lot of capacity, so much so that the subcontractor recently sold an ageing vertical machining centre and decided not to replace it. A particular feature of the compact B436-Y2 (3.7 m x 1.5 m footprint without peripherals) is that the counter-spindle has two degrees of freedom, in the X-axis as well as the Z-axis, allowing it to be offset by 170 mm from the centreline of the main spindle. The design eliminates interference between the turrets when simultaneously machining the front and reverse ends of complex components. It also allows an unusual arrangement where a tailstock can be advanced in the space vacated by the offset counter spindle to enable turn-milling between centres using the main spindle and simultaneous reverse-end machining using the counter spindle and second turret. The machine’s speed and capability derive from 11 kW / 7,000 rpm / 62 Nm opposed spindles and 4.6 kW / 6,000 rpm / 22 Nm tool drives in the 12-station turrets, which index at 150 milliseconds station-to-station. Rapid traverse is 30 m/min in Z and half that figure in X and in the 25 mm Y-axes.